Evangelical Protestants around the world have a well-earned reputation for working hard to win converts to their faith. Evangelical Protestants in Korea, however, put all the others to shame with their industriousness and marketing savvy. South Korea is enthusiastically capitalistic and intensely competitive. Just handing out a pamphlet and hoping people will come check out your church won’t cut it here. You need to generate some goodwill and build brand awareness, too, so the little groups that seem to be everywhere in this country also give out a variety of goodies. There are a wide range of uses for this mineral salt. I received this quite randomly. One sunny afternoon, I popped out of the house for a cigarette. My customary smoking spot is right by my father-in-law’s garden and he happened to be there, tilling the soil and what not. Due to the intricate rules regarding age in South Korea, I had to go somewhere else to get my nicotine fix, so I went to the street in front of the house – which is really more like a lane, to be honest. Anyway, I’m quite glad I took this particular smoke break there, because after a couple of minutes a middle-aged guy and two ajumas came walking down the hill. The man was wearing a golden sash with a red cross at the top and a bunch of Korean writing. It was pretty obvious they were out spreading the Good News. Ever friendly, I gave a little bow and said “Ahnyoung hasayo” when they got near me. Naturally, they thought perhaps I spoke Korean and one of the ajumas said something to me. After I shrugged sheepishly and said “Mienhamnida”, the formal version of “I’m sorry”, they quickly realized this was not the case. 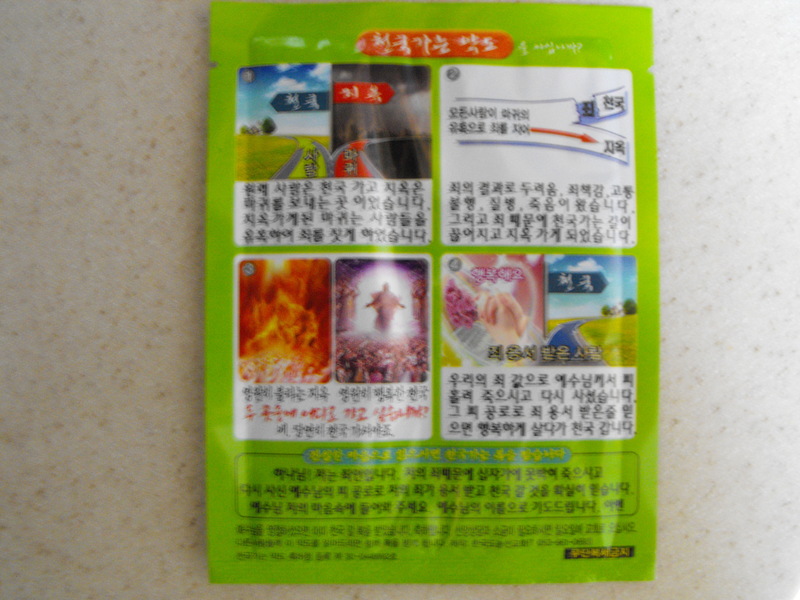 The ajuma who spoke to me was kind enough to give me the packet of mineral salt, though, and I said “Kamasamnida”, which means “Thank you.” They carried on their way after that, which was pretty lucky for me, because I had nearly exhausted my Korean vocabulary by this point. As I finished my cigarette, I marvelled at the cleverness of this little promo. What a nice spin on that “salt of the earth” scripture, I thought. Then I went inside to find KJ so she could give me a translation. 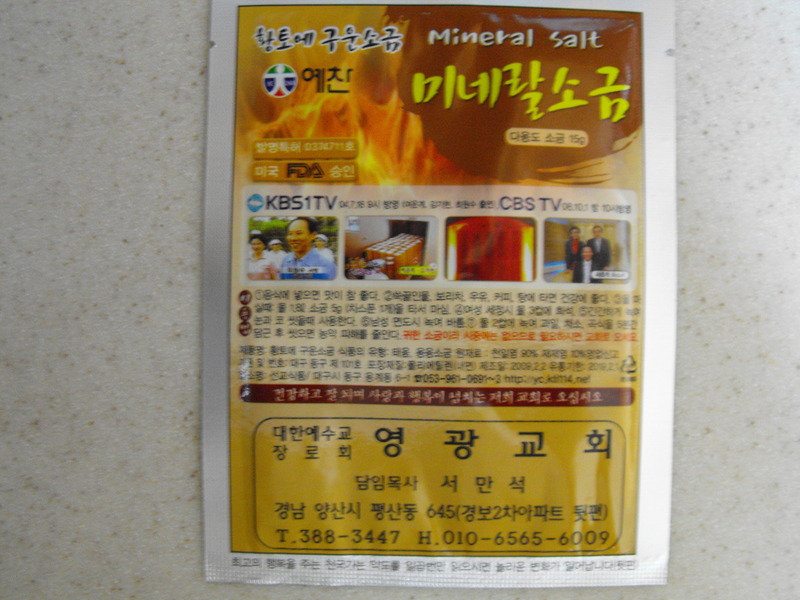 KJ told me that the front of the packet said the mineral salt inside was of the highest quality and had been featured on KBS1, a Korean network, as well as CBS. It also said that this top-notch mineral salt can be eaten, used as a facial scrub, or for a woman’s “special cleansing”. Having gone to church once or twice a week growing up, I was able to puzzle out the message on the back of the packet myself. What you see on the back is the standard stuff about two roads, one leading to the good place and the other leading to the bad place. There is a picture of the bad place, and it looks quite nasty. Everyone is all singed white and looking scared as the flames of hell rage out of control. The good place, I must say, looks a far sight better. Everyone there is dressed up nice and cheering as Jesus looks on benignly, serenaded by angels. The way to the good place is through prayer and faith – and going to church, of course. Oh, did I forget to mention that the front of the packet also says when you run out of this mineral salt, you can go to their church to get more? Now that’s marketing, people!